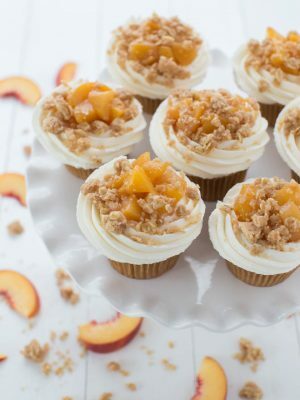 Peach Pie Cupcakes are a fun twist on a classic dessert! 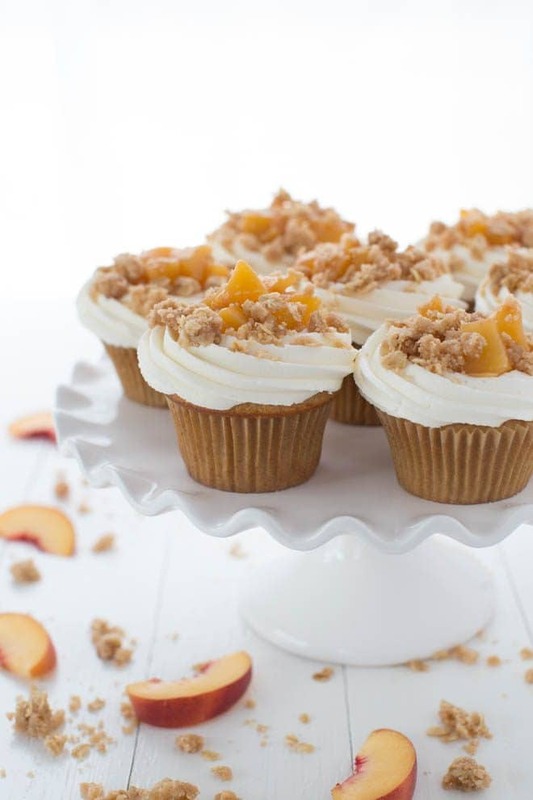 Light vanilla bean cupcakes are topped with homemade peach pie filling, vanilla buttercream frosting and baked crumb topping. You need these cupcakes in your life! Trust me, they are worth it. 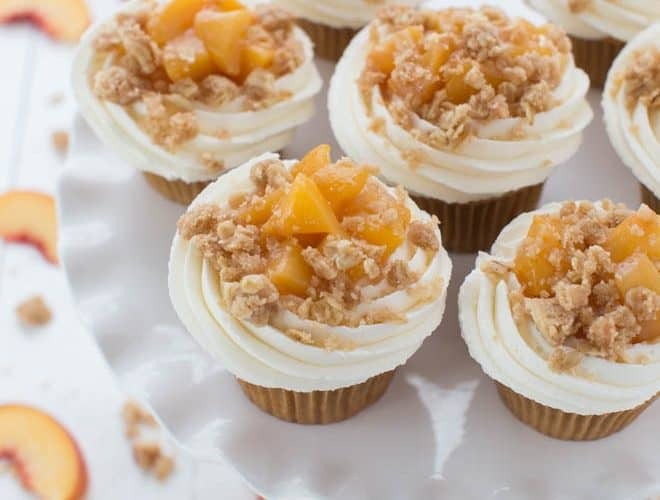 Rather than make a classic peach pie this summer, I decided to combine my love for cupcakes with my love for fresh peaches. 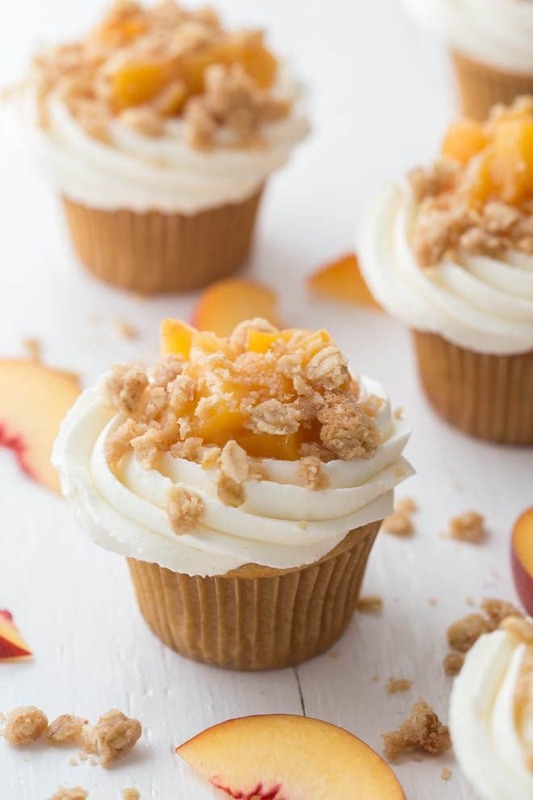 Peach Pie Cupcakes combine vanilla bean cupcakes with delectable vanilla bean frosting and homemade peach pie filling. I think they are even better than peach pie! The baked crumb topping adds a fun and tasty twist. Who says you can’t have cupcakes AND pie? Don’t be intimated by these cupcakes. 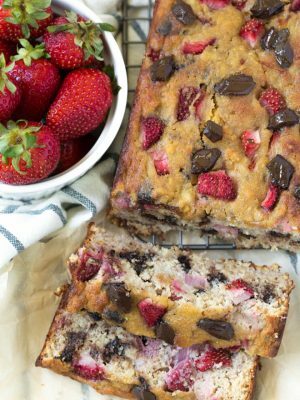 They are actually relatively easy to make using simple flavors. 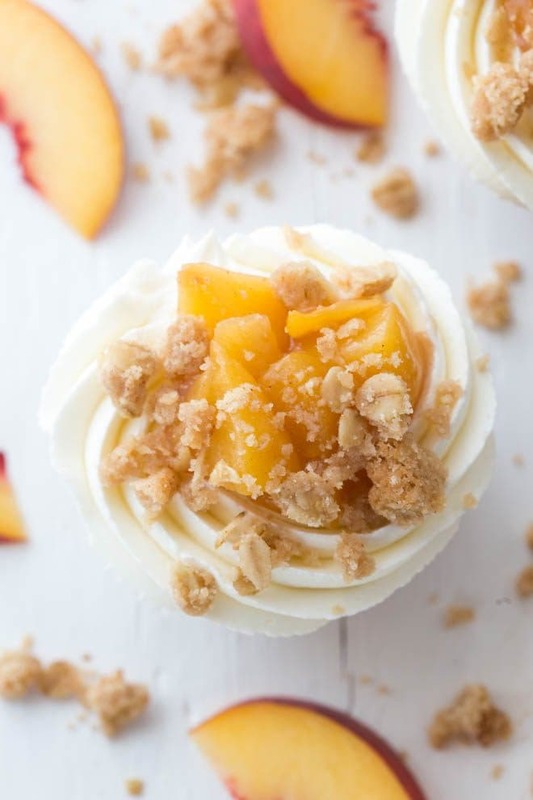 When classic vanilla bean is combined with fresh peaches and crumb topping, it creates an irresistible treat that will impress your friends and family. Last month I moved into my new photography studio and workspace and these delectable cupcakes were one of the first recipes I photographed. I’m completely in love with my new light and workspace and can’t wait to share more new recipes from the studio soon. The studio also has a fun prep station area so that I can shoot more Instagram videos while preparing the recipes. Make sure you are following me on Instagram to take a peek into my typical work routine. For these cupcakes, I used a large open star tip to pipe the frosting around the edges. You need to pipe the frosting around the edges leaving enough space to layer the pie filling on top. Go ahead, grab some fresh peaches on your next visit to the grocery store or farmers market. 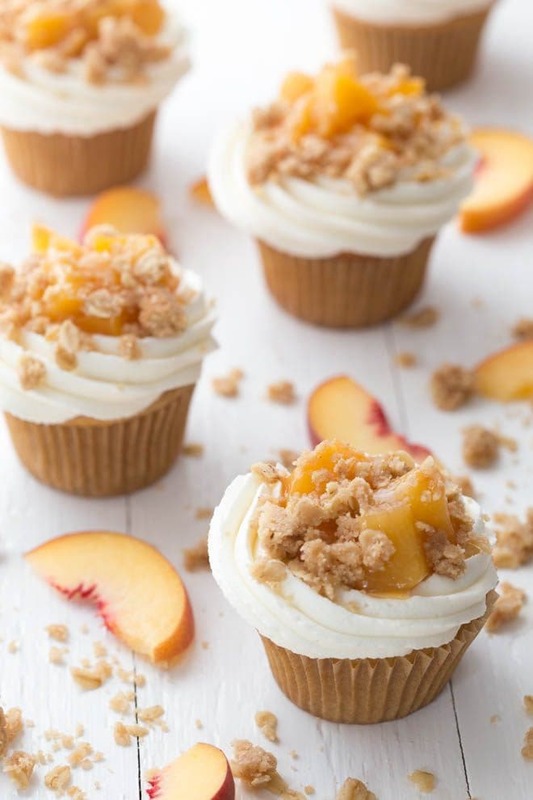 Bake a batch of peach pie cupcakes and indulge in one of the freshest flavors of the season. Sift together flours, baking powder, salt, cinnamon and nutmeg. In the bowl of an electric mixer fitted with the paddle attachment, cream the butter and sugar together on medium-high speed until pale and fluffy. Add eggs, one at a time, beating until each is incorporated, scraping down sides of bowl as needed. Add vanilla. Reduce speed to low. Add flour mixture in three batches, alternating with two additions of milk, and beating until combined after each. While the cupcakes are baking, prepare the peach topping. To make the peach topping, heat the butter in a medium-large skillet. Stir in the peaches, sugar, cinnamon and lemon juice. Heat until the fruit begins to release its juices. Add 2/3 cup of water to the pan and bring the mixture to a low simmer. Cook until the peaches are just fork tender but not mushy. In a small bowl, combine the remaining 2 tablespoons of water with the cornstarch, and whisk lightly until smooth. Add the cornstarch mixture to the peaches and cook 1-2 minutes more, until the mixture has thickened. Let cool thoroughly before topping the cupcakes. While the cupcakes are cooling prepare the crumb topping. Set oven temperature to 400 degrees F. In a medium bowl, stir together the melted butter and sugar. Add the flour, oats and cinnamon and stir until combined. Crumble into large pieces with your hands and sprinkle in a baking disk. Bake 10 to 15 minutes, or until crumble starts to brown slightly. Remove from the oven and let cool completely. To make the frosting, in the bowl of an electric mixer fitted with the paddle attachment, beat the butter on medium speed for about 5 minutes. Turn the mixer down to low speed and gradually add in the confectioners’ sugar until incorporated. Add in the vanilla and salt and mix until incorporated. Turn the mixer back up to medium-high speed and beat for an additional 4 minutes, or until light and fluffy. Pipe frosting around the edge of each cupcake, leaving a well for the topping. Divide peach topping evenly among cupcakes. Sprinkle with crumb topping. Enjoy! We use a large open star tip for pipping the frosting. If you make these cupcakes, please tag @SpoonfulFlavor on social media and use the hashtag #spoonfulflavor! Enjoy! I found the filling to be really tart. I like the recipe, but maybe I'll back off a little on the lemon juice and add a touch more sugar (or even light brown sugar) for sweetness. Hi, Susan! Thanks for your comment. You can definitely reduce the lemon juice, if desired. I cannot wait to give these a go. Congrats on the new space, I'm sure it's exciting. I'll be picking up some peaches this weekend! These are so perfect! These cupcakes are amazing and they scream summer to me! This looks wonderful! 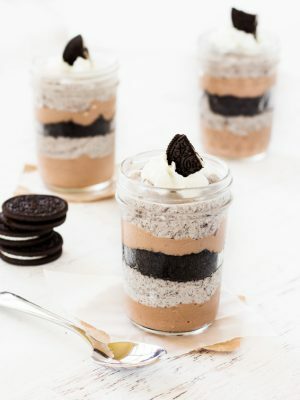 Love that combined pie and cupcakes into one easy to eat dessert! I want to stuff my face with a couple of these cupcakes! They look so good! 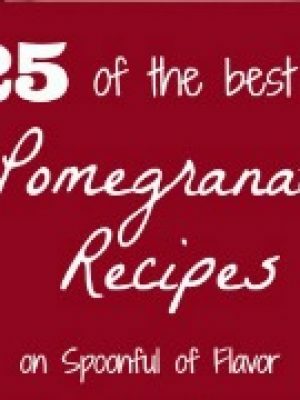 Peach desserts are my favorite, and these look incredible! I'm loving that topping! YES, you're right....I need these in my life, like right now!! They look incredible!! I love the crumb topping on these cupcakes!! That's such a great idea - these look amazing! The crumb topping is definitely an essential part of this cupcake! Thanks, Stacey! Oooooo! You know I really do need these in my life! I've been trying to cut back on the amount of sweets I've been eating lately. Maybe I'll re-start on Monday ;) These look amazing! Hi, Patricia! I hear you. I try not to eat too many sweets but can never resist a good cupcake! 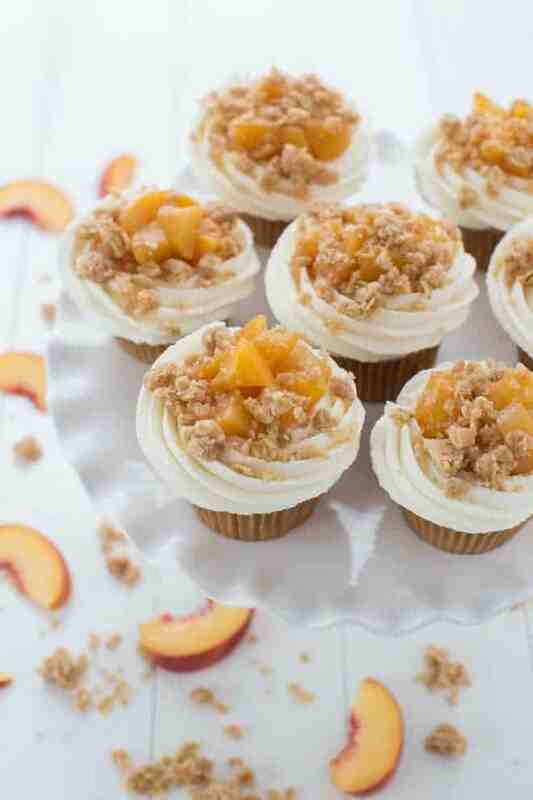 These peach pie cupcakes are not only beautiful, but also delicious!